FILE - News photographers take photos of a model of the White House on a giant planning map during a media tour highlighting inaugural preparations being made by the Joint Task Force-National Capital Region for military and civilian planners at the DC Armory in Washington, D.C., Dec. 14, 2016. Civil rights lawyers threatened Thursday to sue the U.S. government agency that manages much public land in Washington, accusing it of quashing dissent by not issuing permits for protests of Republican Donald Trump's presidential inauguration. Up to 900,000 people are expected to pack into the nation's capital for the New York businessman's January 20 swearing-in to his first political office. Some plan to criticize Trump's more controversial promises, including plans to build a wall along the Mexican border and deport illegal immigrants. Only three of the 26 groups seeking to stage rallies either protesting or celebrating Trump's election independently of the Trump Presidential Inaugural Committee have received permits. 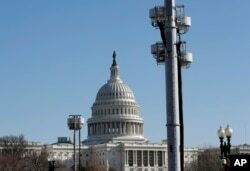 FILE - The West Front of the Capitol in Washington is shown Dec. 28, 2016, with temporary communications towers as preparations continue for inauguration of President-elect Donald Trump. The Partnership for Civil Justice Fund on Thursday said it would sue the National Park Service, which manages spaces including the inaugural parade route and the grassy Ellipse near the White House, if the permits are not issued by Friday. "Fifteen days before the inauguration, the National Park Service and the Trump Presidential Inaugural Committee are stonewalling and refusing to release permits that are vitally needed by organizers in order to plan and execute peaceful, lawful free-speech activities," Mara Verheyden-Hilliard, the fund's executive director, told a news conference. The Park Service and the Inaugural Committee, a private group, had no immediate comment on the lawsuit threat. The Park Service has maintained it is following a procedure in place since 2008 for presidential inaugurations by turning over control of sites along the parade route from the Capitol to the White House. The Inaugural Committee has said it needs all the space allotted, according to Park Service spokesman Mike Litterst. Three liberal groups, the ANSWER Coalition, the American Constitution Society and the Black is Back Coalition, have been permitted to hold events near the parade route, but only ANSWER was granted one for Inauguration Day. Verheyden-Hilliard, a successful litigator for Washington protesters for more than a decade, said the permits sought cover spaces along the Pennsylvania Avenue parade route on January 20, and other spaces, including the Ellipse, the following day. 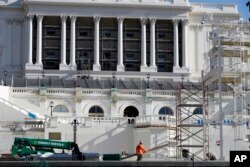 FILE - The West Front of the Capitol is seen as work continues on the stand for the inauguration of President-elect Donald Trump in Washington, Dec. 28, 2016. Protesters will be among the 800,000 to 900,000 people who Chris Geldart, the District of Columbia's homeland security director, estimates will attend Trump's swearing-in. Some 3,000 police officers and 7,000 National Guard troops from outside the District will be on hand to help provide security, Geldart said in a phone interview. The biggest inauguration protest, the Women's March on Washington on Jan. 21, will go on regardless of the Park Service dispute since it will be held on city streets. At least one protest could come with a cloud of marijuana smoke, as a pro-pot lobbying group plans to distribute 4,200 joints near the inaugural site. The DC (District of Columbia) Cannabis Coalition will start handing out joints at 8 a.m. January 20 on the west side of Dupont Circle in the nation’s capital, where recreational marijuana is legal. Then, marchers will walk to the National Mall where the real protest will begin. At exactly 4 minutes and 20 seconds into Trump’s inaugural address — 420 is the commonly known code for marijuana — thousands of protesters plan to light up. “The main message is it’s time to legalize cannabis at the federal level,” said Adam Eidinger, the founder of DCMJ, a group of D.C. residents who introduced and helped get D.C.’s marijuana legalization initiative passed. The initiative, passed in 2014, made the possession of up to 2 ounces of marijuana legal. However, smoking marijuana along the parade route would violate the laws of both the District of Columbia — which allows it only in private spaces — and the federal government, which bans it outright.